I don’t think anyone can truly grasp this concept in mere words. But I’m going to try. Call it a pretty intense bout of homesickness or a frustration with how complicated things are down here in the states. No matter what way you slice it, Alaska is a state that calls to us. 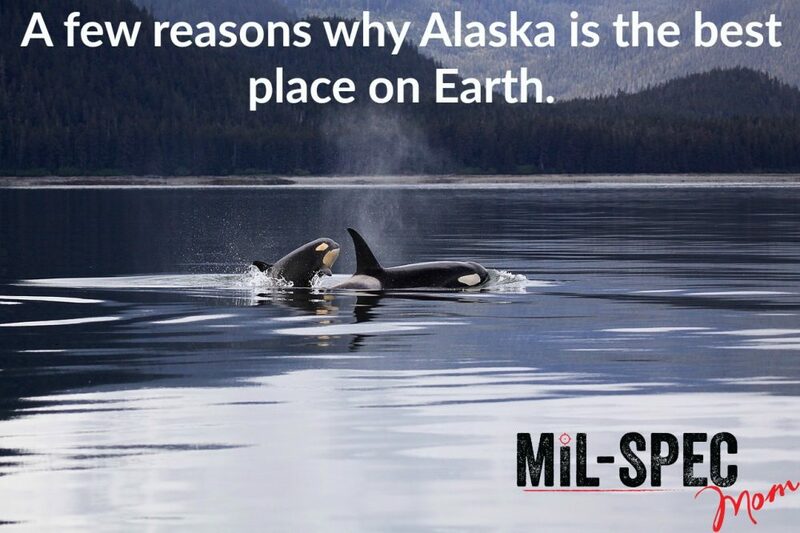 This is what many Alaskans love about Alaska. It’s hard to get to, which means those that end up there, purpose to be there. We don’t get too many transients, which is nice. I truly believe that Alaska chooses who gets to stay and enjoy its beauty. Although we’re not a huge fan of companies that charge extra for “shipping outside the US”. If you’ve ever seen pictures of mountains or have been blessed enough to see them in person then you understand what I’m saying here. The mountains are breathtaking. Even for those of us who have and do wake up every day and get to see them. They are regal. They can be dangerous and need to be respected, but they are absolutely stunning to see. When the early morning light hits the snow caps it makes the mountains glow. When the sun’s setting rays light up the mountain scape, shining deep hues of purples, pinks, and oranges from behind, you wonder why the whole country doesn’t live here, just to see this one moment. The aurora borealis. To see the bright neon lights dancing across the sky is magical. The different colors, patterns, shapes, makes your heart sing. Even permanent residents still poke their head outside to see what they look like. Seeing the majesty of dancing light in the sky never gets old. So much wildlife! It’s literally everywhere. Seeing moose on a daily basis is no big thing. Seeing Eagles is also no big thing. When I lived in Metlakatla, we would take our visitors to our landfill to see Eagles. It definitely changes your perspective when you see these majestic creatures flying off into the sunset with a dirty diaper. Another bird that’s pretty awesome is the Raven. These little guys, I’ll tell you what. They’re smart and they’re wily. When I lived in Sitka, I remember having to bungee our trash lid down so the Ravens wouldn’t open the lid and pick through our trash! Another fun fact for these creatures? They love McDonalds french fries and it’s great to see these wily creatures hopping around fighting over fries! Let’s not forget the beautiful salmon, the bears, the whales, moose, and all the slugs. It’s a wildlife lovers’ paradise. Alaska has a lot of ocean! It’s beautiful, terrifying, and awe-inspiring. It can mildly lap on the beach as you sip your morning coffee or it can be tumultuous and swallow boats, and their crew hole. The ocean shows an unbridled passion and demands respect from all those who dare enter it. It’s also a way of life for just about everyone. It’s making a Christmas tree forest in Nome, in January on the ocean because it freezes right up to the beach and is many feet thick that you can drive your car around on there! It’s going crabbing and pulling up your pot only to find a six-pack of beer because someone helped themselves to your crab! It’s having fresh crab on your plate that was alive in the ocean less than an hour before. The Ocean gives us an abundance of food for our freezers. It helps us live! But seriously, you can’t beat fresh smoked salmon. The culture. It’s really one of the best parts of Alaska. It’s not just the Russian influence, it’s not just the Alaska Native American influence, it’s not just the Pilipino influence. It’s all of it together. It’s celebrating Alaska Day (October 18th) while eating Lumpia and Pancit, and watching traditional native dances at the long house. It’s eating Seaweed & Rice, with herring eggs, while walking up to Castle Hill and watching the reenactment of when Alaska was purchased from Russia. It’s also putting Ooligan Grease in in your food because it’s a miracle cure for basically everything! It’s picking fireweed and making syrup out of it. It’s also a lot of warm coffee; Raven’s Brew Dead Mans Reach obviously. It’s Xtra-Tuffs and hoodies, and Theobroma Chocolate Bars and the smell of fresh WinterSong Soap being made from the WinterSong Soap Company. It’s a mentality also. It’s knowing that everyone you meet will be your friend. It’s having a respect for your fellow man. It’s going out of your way to be polite and helpful even when they won’t or can’t return the favor. The culture is always being a little late because that’s just how the island works. Island time, right? ?It’s also knowing that you’ll be left alone when you want to be. It’s a level of respect that I’ve not ever seen in the states. It’s just-Chill. Alaska is not for type-A personalities, however. We are a laid-back people who just want to enjoy our friends, enjoy our fish, and the beauty of our scenery. Alaska is not for those who thrive on schedules, control, or demanding something be done a certain way. We have our own way, as we can be a stubborn people. We thrive on being different and being ourselves. We thrive on practicality and function. We are not a simple people, but we enjoy a simple life. We enjoy the simplicity of small town living. It’s complicated enough just finding companies to ship goods up here without paying double of the product you’re purchasing; we don’t need anything more unnecessarily than that. The people have a survival attitude. If something needs to be done, you just do it! We are hearty, we are tough, yet we are kind and passionate. Alaska is fresh. It is real. Most of it is uncorrupted by concrete jungles. It is the salmon run that always brings fresh seafood! It’s the endless cleaning of the fish, and vacuum sealing until you can’t see straight. It’s the salty air and fresh wind, all the time. It’s putting tinfoil on your windows during the summers so you can get to sleep at a reasonable hour! It’s the weeks of rain and that moment where everyone takes a break to enjoy the few hours of sunshine we get during the rainy season. It’s a place where all different walks of life can meld together into a community. It’s a place where all the pro-vaxxers and anti-vaxxers can get alone. It’s a place where all religions can get along. It’s a place where all cultures and ethnic background can get alone. It’s a place where people from both sides of the aisle can get along. It’s a place where literally everyone knows your name and it makes your heart sing when they do. Be here now: A reminder to confront fear head on and conquer it! Nila is an Army Wife, mother of two boys, and a firearms instructor. She is currently pursuing a double masters in Homeland Security & Emergency Disaster Management, while trying to balance the daily life of being a SAHM/WAHM. She loves ice cream and learning about self-defense as a mother. For more info please click the "About Mil-Spec Mom" tab at the top. Hi! My name is Nila Rhoades. I am an Army Wife, mother of two boys, and a firearms instructor. I am currently pursuing a double masters in Homeland Security & Emergency Disaster Management, while trying to balance the daily life of being a SAHM/WAHM. I love ice cream and learning about self-defense as a mother. For more info please click the "About Mil-Spec Mom" tab at the top. © Nila Rhoades and “Mil-Spec Mom”, 2014-2019. Unauthorized use and/or duplication of this material without express and written permission from this site’s author and/or owner is strictly prohibited. Excerpts and links may be used, provided that full and clear credit is given to Nila Rhoades and “Mil-Spec Mom” with appropriate and specific direction to the original content.